Since at least the fall of 2006, the state of Michigan’s Office of Retirement Services had been referring to the state’s teacher pension plan – the Michigan Public School Employee Retirement System - as “one of the best public pensions around.” But following several recent Capitol Confidential stories this spring and summer giving details that explained why Michigan teacher pensions really are much more generous than private sector retirement plans, the “best public pensions around” sentence vanished from state government websites. Sometime after a June 2 article which referenced the current edition of the teacher retiree handbook, the page with the statement on it appears to have been altered in the official online edition so that the “best public pensions around” boast has been removed. However, thanks to a copy of the exact same edition of this handbook left on the website of at least one Michigan school district, we have the original text. (For comparison of both documents, see page six, first sentence of section one). While generous public employee pensions are going the way of dinosaurs due to their excess burden on taxpayers, nothing of any substance has been done to change the public school teacher retiree benefits since this spring. So it shouldn’t have lost its purported status as “one of the best public pensions around” in the state’s official online version of the handbook. But this is not the only recent case where Michigan Capitol Confidential stories have caused information to disappear from government websites. And for some public officials, the habit is far older than the Internet. The job of Winston Smith in George Orwell’s classic novel Nineteen Eighty-Four was to re-write history for ‘Big Brother’ – the leader of the oppressive regime that ran his life. As part of an army of editors who made inconvenient facts and documents disappear into a “memory hole,” he replaced them with new “facts” and documents that reflected what the regime wanted the populace to believe. A real-life example was the Soviet regime of Joseph Stalin, which went so far as to have the images of out-of-favor Soviet officials removed from photos where they had been pictured standing next to Stalin during friendlier times with the dictator. 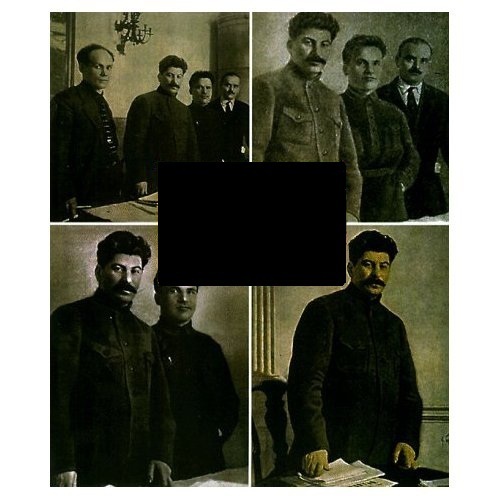 In one famous instance, a photo of Stalin posing with three other cronies is successively edited and officially reissued three times over a period of years until everyone but Stalin is removed from the picture. The politicians and bureaucrats who run public entities in Michigan are of course in no conceivable way remotely comparable to the totalitarian brutality of Stalin or Big Brother. But in small ways, they do sometimes have their own versions of the “memory hole” when asked to account for how they spend tax dollars. On March 25 of this year, Capitol Confidential sent a Freedom of Information Act request to the labor studies departments at three Michigan universities. A year earlier, Capitol Confidential reported that the website of the Labor Studies Center at Wayne State University was posting content that was more political and partisan than it was scholarly, almost as if the LSC’s mission was to be more of a political action committee for Big Labor than a taxpayer-financed teaching and research entity. This was made all the more concerning because the LSC website had already been the subject of one earlier complaint to the state’s Bureau of Elections during 2005 for similar conduct, with the result being that the LSC took down the offending web page. Seeking to find out more information about whether university employees were illegally using taxpayer resources for partisan politics, Capitol Confidential submitted narrowly-focused FOIA requests for certain emails of professors working at the labor studies centers at the three state schools that have such entities: Wayne State, Michigan State and the University of Michigan. Initially, this was met with outrage from some of the professors, who accused Capitol Confidential and the Mackinac Center of conducting an ideological ‘witch hunt.’ It even led to a bomb threat against the Mackinac Center’s headquarters. But the focus swiftly turned back to Wayne State when the true reason for the FOIA requests became known to a WJR-760 AM radio audience on April 6. Within hours of the broadcast, the pages cited as potentially objectionable by Capitol Confidential began disappearing from the LSC’s website, and soon the entire site was gone, with only an “under construction” page showing to the outside world. Two days later, a new version of the website was up, sans all of the controversial material. Wayne State officials told the MIRS news service (www.MIRSnews.com) that the pages had been removed so that university lawyers could determine whether they had violated the state’s campaign finance laws. As of this writing, the Wayne State LSC’s website remains clean of the objectionable content. Still left unresolved is whether the removed content, which had been publicly displayed for many years, represented more extensive and perhaps illegal political behavior with public resources that was being conducted in less public ways behind the scenes. Last June, Governing Magazine sung the praises of the Michigan Film Office and a Birch Run restaurant known as the “Oink Joint.” Used in a feature film subsidized by Michigan taxpayers, the previously-shuttered roadside diner was supposedly an example of a re-opened and successful business created by Michigan’s highly controversial film subsidy for Hollywood producers. When the Governing story was published, the Film Office was still boasting of the Oink Joint on its website, claiming that it was producing sales 60 percent above projections. But … a tip from the head of the Michigan Taxpayers’ Alliance to Capitol Confidential resulted in a June 18, 2010 story revealing that instead of trusting the details on the Film Office website before writing their story, Governing should have placed a phone-in order to the Oink Joint for baby back ribs: Many months earlier, the restaurant had once again gone out of business. The ‘Oink Joint’ had been ‘disappeared’ down state government’s memory hole.